Remember my recent single city girl purchase of a Keurig at Macy's Herald Square? Well, I'm now officially obsessed with brewing pumpkin spice coffee at home. Saving money from my usual latte binges around the neighborhood and having the opportunity to sip on a hot cup before leaving for work in the morning, feels pretty darn good. 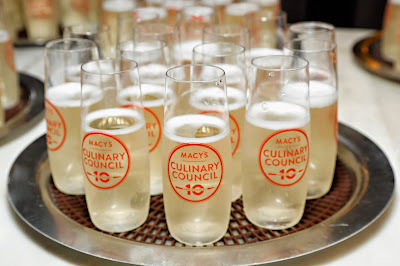 After giving you the inside tip on getting an invite to the Macy's Culinary Council 10th Anniversary event with a purchase of $100 or more in the home department - like my rockin' Keurig - I attended the event, alongside my dear foodie friend Sarah. When the elevator opened up to the 6th floor, immediately I had to snap a shot of the incredible view on Instagram. Can you believe that Stella 34, the restaurant inside Macy's where the event was held, was used as storage until only a few years ago? Good thing this space and beautiful view is now for shoppers who want to take a break to dine, rather than a boring home to boxes, seasonal merchandise and mannequins. Alongside fellow press, bloggers and guests, we dined on a plethora of small plates made by some of the greatest chefs in the culinary world, who were present to take part in the evening. 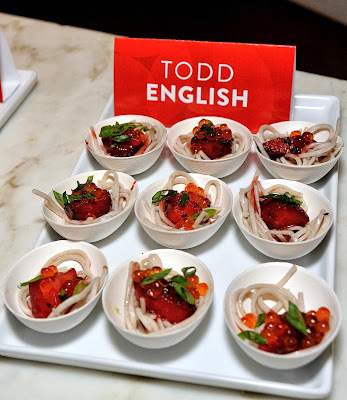 That’s right, chefs Todd English, Marc Forgione, Nancy Silverton, Marcus Samuelsson, Ming Tsai, Takashi Yagihashi, Johnny Iuzzini and Tom Douglas made appearances with delightful speeches. This was a sponsored post. I was compensated for content. All opinions are my own. Be Yourself, Together: Target Gift Card Giveaway!